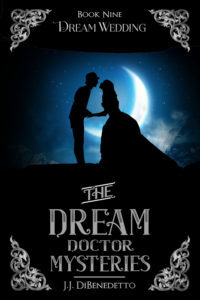 The Dream Doctor Mysteries is ten complete novels and a collection of short stories as well. 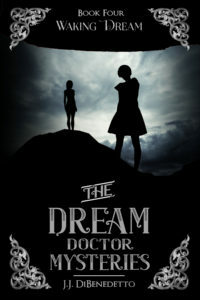 You can listen to a Blog Talk Radio interview about the books (mainly Dream Student) here. 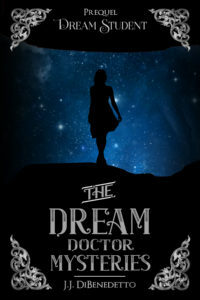 The books follow the adventures of Sara Barnes, who as the first book opens has just discovered that she can see into other people’s dreams (hence “Dream Doctor”). 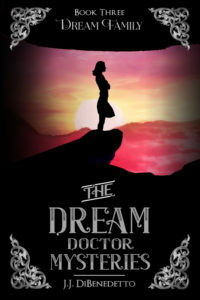 Where did the idea for the Dream Doctor Mysteries come from? The series came about from asking a simple question: why do characters in mystery stories try to solve crimes themselves, rather than going to the police if they’ve come to believe that their neighbor across the hall has murdered somebody and buried them in the garden? It’s what most of us would do, right? Would you, Dear Reader, go poking around to try and catch someone you thought was capable of such an act, or would you do the sensible thing and call 911? My answer to the question was: one reason you might not call the police is if the only evidence was in your head. If you could somehow see the crimes from the criminal’s eyes. In their dreams, maybe? What could you do with that? The police wouldn’t believe you. If you wanted the crimes to stop, you’d need to find some sort of tangible proof to present to the authorities. The prequel to the series, Dream Student, takes place over the winter of 1989-1990, when Sara is a junior at a college that looks a lot like my alma mater), and chronicles Sara’s efforts to find and catch a serial killer, while trying to figure out if she’s falling in love, and at the same time hoping to get into medical school. 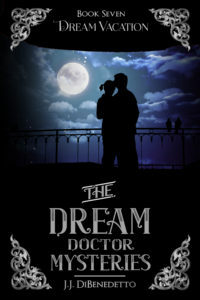 Dream Doctor officially begins Sara’s tale in the summer of 1991, when she has to survive her first month of medical school, adjust to married life, and most importantly, figure out who’s trying to poison the most unpopular professor in the school. It’s December 1996 when we meet Sara again in Dream Child. She’s just learned that her four-year-old daughter has inherited her talent for seeing the dreams of others. This time she’ll have to interpret her daughter’s dreams and use what she learns to discover who’s blackmailing a Congressman. 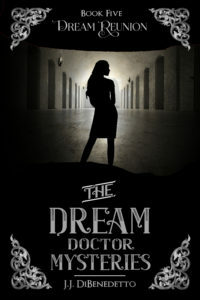 Dream Family finds Sara in August of 1998, when she’s mistakenly arrested on her very first day at her new medical practice. She’s released the next day and the real culprit caught, but it’s a shattering experience for Sara. 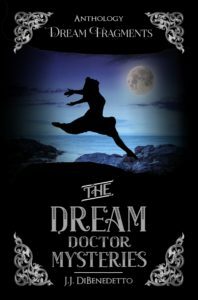 While she struggles to recover, Sara will have to turn to her dreams to help prevent her godmother from suffering the same fate. 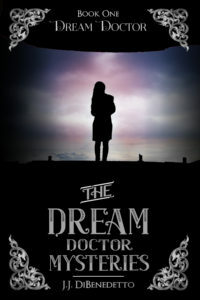 Waking Dream jumps ahead to the winter of 2000-2001, and Sara discovers that she and her mother and daughter aren’t the only ones who have the ability to visit other people’s dreams – when her own dreams are visited by a stranger. It doesn’t take long for Sara to realize that this fellow dreamer is using her talent for selfish and destructive ends – and she’s got her sights set on Sara and Brian. 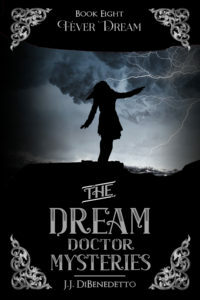 In Dream Reunion, Sara returns to college for her ten-year class reunion, and her supernatural dreams follow her. She’s the only one who can stop a classmate from making a terrible – possibly fatal – mistake. 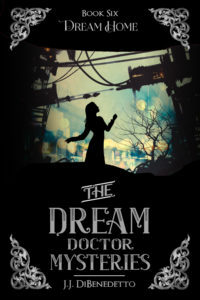 Dream Home is the seventh book of the series. Sara and her family move to a small town in upstate New York. Sara finds herself having trouble at work, and also troubled by the dreams of an old man who’s expecting a disaster to strike the town – and Sara can’t help but wonder if he’s right. In Dream Vacation Sara and her family are off to Europe for a long-overdue holiday. But the trip becomes a harrowing ordeal when her teenage daughter runs away, leaving no clues behind – and for the first time, Sara’s dreaming talent fails her, too. 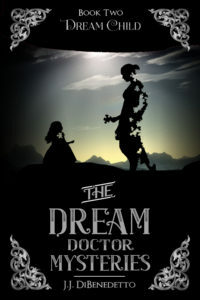 In Fever Dream, Sara’s determination to discover what caused the death of one of her young patients leads her to a deadly conspiracy, and powerful forces who don’t like her questions try to silence her, permanently. The final book of the series is Dream Wedding.” Sara’s daughter, Lizzie, is about to graduate college and also get married, but family celebrations are cut short when her son is nearly killed by a drunk driver. I’ve got a collection of short stories from the series, called Dream Fragments. The stories span the entire series, and give you some different viewpoints (all the novels are written from Sara’s first-person point of view). Dream Fragments is free at all retailers! One of the stories in Dream Fragments is Betty & Howard’s Excellent Adventure. I list it separately because there’s an amazing audiobook edition of this story, narrated by Doctor Who star Nicola Bryant! You can buy all the books, in Kindle format, in paperback and as professionally-recorded audiobooks, at Amazon, and everywhere else ebooks are sold! Will all these books be translated and sold in France?? Will all these books be translated and sold in France? I’m working on it – so far only one is, though.